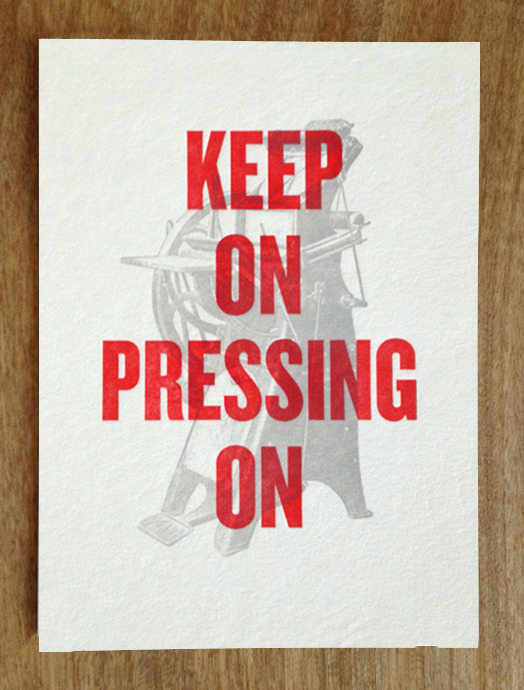 Because of the Cross…We Keep on Pressing on! 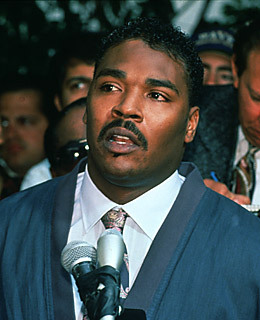 On May 1, 1992, after four police officers were acquitted of the savage beating of Rodney King, Rodney uttered this now famous line: “Can we all get along? Can we get along? . . .
That phrase instantly became a joke, yet as we view the world in conflict and turmoil, as we view Christians in conflict and turmoil, is it possible for us to all get along? No, not unless we commit to following the Cross of Jesus Christ. 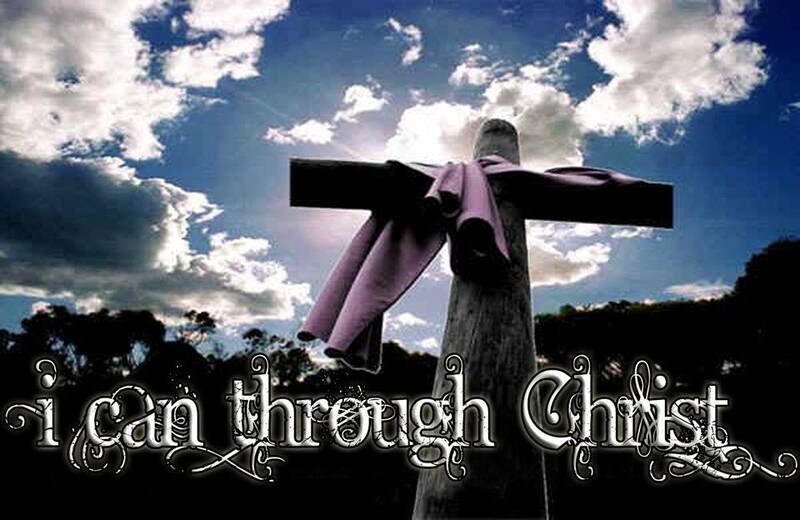 Colossians 1: 19 For in him all the fullness of God was pleased to dwell, 20 and through him to reconcile to himself all things, whether on earth or in heaven, making peace by the blood of his cross. 21 And you, who once were alienated and hostile in mind, doing evil deeds, 22 he has now reconciled in his body of flesh by his death, in order to present you holy and blameless and above reproach before him, 23 if indeed you continue in the faith, stable and steadfast, not shifting (moving or falling away) from the hope of the gospel that you heard, which has been proclaimed in all creation under heaven, and of which I, Paul, became a minister. Paul addressed a fleshly church in 2 Corinthians. 2 Corinthians 12:20-21 20 For I fear that perhaps when I come I may find you not as I wish, and that you may find me not as you wish—that perhaps there may be quarreling, jealousy, anger, hostility, slander, gossip, conceit, and disorder. 21 I fear that when I come again my God may humble me before you, and I may have to mourn over many of those who sinned earlier and have not repented of the impurity(uncleanness of soul), sexual immorality (porneia-idolatry like Israel), and sensuality (seeking your own pleasure) that they have practiced. Paul said two things that are pretty amazing in their importance. When the church is overtaken with “quarreling, jealousy, anger, hostility, slander, gossip, conceit, and disorder”, it should not make us quit or get angry, it should humble us, and bring us low before the Lord. The only way to cleanse such a church is to repent of uncleanness. We have been made morally and spiritually ‘dirty’. We need to repent and ask for God to cleanse us. This is why I have been saying since 2007 that you cannot allow yourself to listen to gossip, bad reports, or ‘whispers’ that are negative about someone or something. When you do, it taints your soul, it brings uncleanness to your heart. If you listen to such reports, in order to be clean, you must go to that person and check things out. I made a covenant with my Dad and all the employees of Tompkins Industries in 1983 that I would always give a good report. If I could not say anything good about a person, I would simply be quiet, or if able, go to that person and tell them why I could not give a good report about them. This is a wonderful way to live your life. If you could imagine being a pastor in Germany in 1945, you could get a glimpse of pastoring a church that has gone through a war. 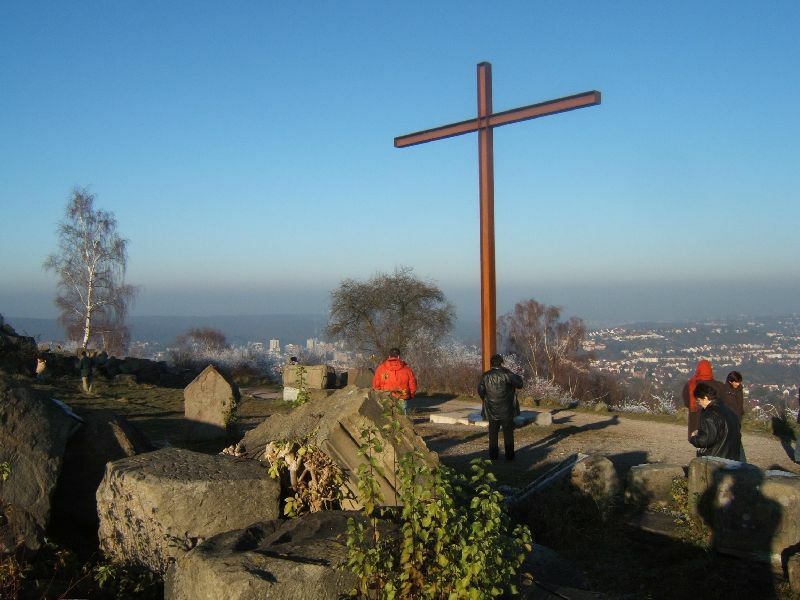 The Stuttgart Declaration of Guilt, was issued on October 19, 1945 by the Council of the Evangelical Church in Germany (Evangelischen Kirche in Deutschland or EKD), in which it confessed guilt for its inadequacies in opposition to the Nazis and the Third Reich. 1. It was an expression of solidarity with the nation in its sin and suffering. The confessors were not standing in judgment against a guilty nation that had been brought to its knees. They were experiencing the pain of the nation and acknowledging their part in its guilt. They did not make excuses. 2. They did not give a false sense of guilt. They stated that they opposed the Nazi regime and suffered as a consequence. But this did not take away from their share of the guilt of the nation. 3. Their sense of guilt did not drive them to despair but to fresh commitment. They committed themselves to a new beginning. Repentance should lead to real change and a commitment to action. As Germany sought to rebuild and re-unify their nation, they chose to work toward a goal rather than stagnate in blame and despair. Paul wrote to the Ephesians church, and encouraged them to walk worthy, walk in humility, bear with one another and maintain the unity of the Spirit. Ephesians 4:1-3 1 I therefore, a prisoner for the Lord, urge you to walk in a manner worthy of the calling to which you have been called, 2 with all humility and gentleness, with patience, bearing with one another in love, 3 eager to maintain the unity of the Spirit in the bond of peace. Unity is never maintained when people resort to blaming others. Now is the time to humble our hearts before the Cross of Jesus Christ and seek His forgiveness and righteousness. Now is the time to cry out for God’s Justice to reign in our church, for His Word to have free course in our midst, and for His Holy Spirit to convict us of sin, righteousness and the judgment to come. Philippians 3:12-14 12 Not as though I had already attained, either were already perfect: but I follow after, if that I may apprehend that for which also I am apprehended of Christ Jesus. 13 Brethren, I count not myself to have apprehended: but this one thing I do, forgetting those things which are behind, and reaching forth unto those things which are before, 14 I press toward the mark for the prize of the high calling of God in Christ Jesus. b. The Cost to all those witnesses. 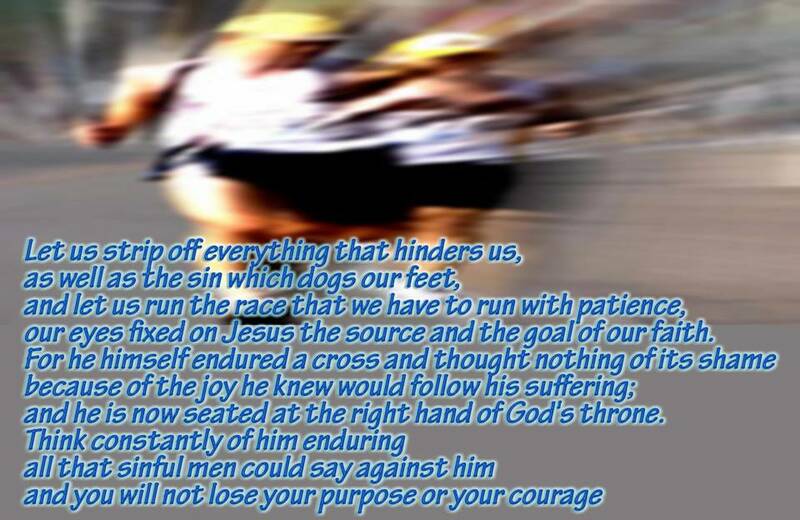 Hebrews 12: 1,2 Therefore, since we are surrounded by so great a cloud of witnesses, let us also lay aside every weight, and sin which clings so closely, and let us run with endurance the race that is set before us, looking to Jesus, the founder and perfecter of our faith, who for the joy that was set before him endured the cross, despising the shame, and is seated at the right hand of the throne of God. 2) We must endure, regardless of the cost. 12:3 Consider him who endured from sinners such hostility against himself, so that you may not grow weary or fainthearted. 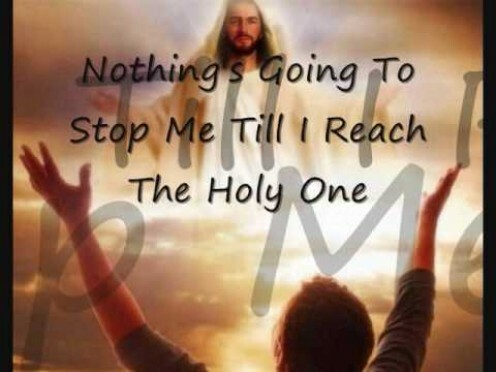 12:4 In your struggle against sin you have not yet resisted to the point of shedding your blood. 12:5 And have you forgotten the exhortation that addresses you as sons? “My son, do not regard lightly the discipline of the Lord, nor be weary when reproved by him. 12:7 It is for discipline that you have to endure. God is treating you as sons. For what son is there whom his father does not discipline? 12:8 If you are left without discipline, in which all have participated, then you are illegitimate children and not sons. 12:9 Besides this, we have had earthly fathers who disciplined us and we respected them. Shall we not much more be subject to the Father of spirits and live? 12:10 For they disciplined us for a short time as it seemed best to them, but he disciplines us for our good, that we may share his holiness. 12:11 For the moment all discipline seems painful rather than pleasant, but later it yields the peaceful fruit of righteousness to those who have been trained by it. We all want healthy bodies. That usually involves exercise, training, strengthening. But as in all things, we get weary, we get tired, we may not feel like going on. Especially if we don’t lay aside those things that distract us. 12:13 and make straight paths for your feet, so that what is lame may not be put out of joint but rather be healed. 1. Following Jesus Requires Effort. c. Feet wander, grow hesitant, even halting. Arthritis refers to a group of more than 100 rheumatic diseases and other conditions that can cause pain, stiffness and swelling in the joints. A little weakness can affect the whole body. Just one arthritic joint can affect your health and well-being. Colossians 2:19 and not holding fast to the Head, from whom the whole body, nourished and knit together through its joints and ligaments, grows with a growth that is from God. 12: 14 Strive for peace with everyone, and for the holiness without which no one will see the Lord. 12:16 that no one is sexually immoral or unholy like Esau, who sold his birthright for a single meal. 12:17 For you know that afterward, when he desired to inherit the blessing, he was rejected, for he found no chance to repent, though he sought it with tears. a. Danger of Losing God’s Favor. 2) He chose his satisfaction rather than God’s. d. Literally cross a threshold and lose your inheritance. 19 and the sound of a trumpet and a voice whose words made the hearers beg that no further messages be spoken to them. 24 and to Jesus, the mediator of a new covenant, and to the sprinkled blood that speaks a better word than the blood of Abel. 12: 27 This phrase, “Yet once more,” indicates the removal of things that are shaken—that is, things that have been made—in order that the things that cannot be shaken may remain. Who is Mitsuo Fuchida? He Cried TORA TORA TORA! As he led the Japanese atack on Pearl Harbor! 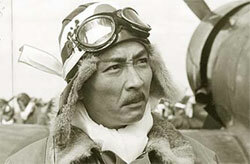 This incredible attack was led by a 39-year-old Japanese top gun pilot, Commander Mitsuo Fuchida. whose life hero was Adolf Hitler. Fuchida led 360 Japanese airplanes into the harbor at Honolulu and devastated a whole nation and triggered, as you know, the massive death that came about through American atomic retaliation as well as conventional weaponry. 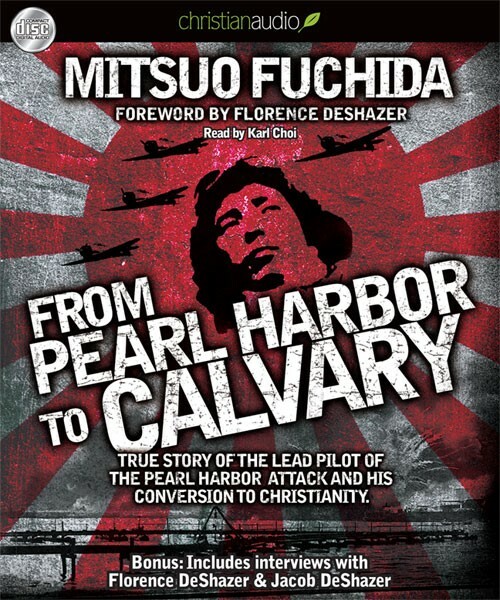 Mitsuo Fuchida, a name that you read over and over and over and over in anything you ever read about World War II. His plane was hit numerous times as he came and went from Pearl Harbor, but he survived. This year I want us to begin a Journey, Journey 2010, in which we discover the awesome power of our creator God in a more personal and intimate way. 2009 is over, and I admit that at times I felt powerless, inadequate to deal with situations with friends that resulted in them turning away from this awesome God. Sure there were times of victory. but I lost some good friends last year, friends that made conscious decisions to turn away from the church, from our fellowship, and I have trouble not taking that personally. When people make decisions that I know will affect their eternity and their love for God, and affect their families, I don’t like it, it really bothers me. That is why I want this Journey 2010 to be life-impacting. John reveals this to us in 1 John 2:16: For all that is in the world— the desires of the flesh and the desires of the eyes and pride in possessions—is not from the Father but is from the world. The world desires to keep us from this Journey 2010. The world wants us to see a God who is powerless. So these problems that are in every persons life, will try to dog us, to drag us down, limit our seeing Him who is invisible. We must recognize this when this happens, and deal with it. Crystal is addressing his pal who, nearing 40, feels he is at a dead-end. Brunno Kirby: I’m at a dead-end. I’m almost 40 years old. I’ve wasted my life. Crystal: Yeah, but now you got a chance to start over. You know? Phil, remember when we were kids? And we’d be playing ball and the ball would get stuck up in a tree? And we’d yell “Do over!” Huh? Crystal: You got a clean slate.. Crystal tells him that he can start over again. His life can be a do-over. Kirby: You know you were right, Mitch. 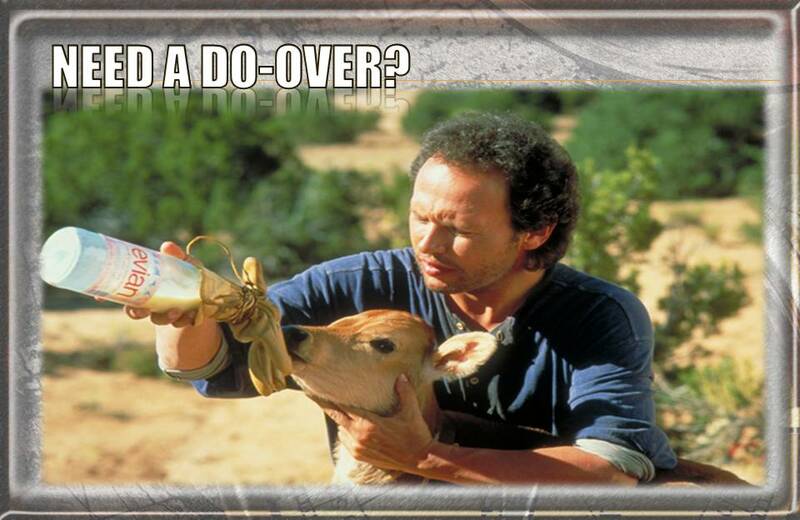 My life is a “do-over”. It’s time to get started. Crystal: I hope I can help. Kirby: Now I’m gonna go home, and I’m gonna get Kim pregnant. Something like that happens every January 1. We all get a “do-over”—another chance to do it right. If 2009 was a tough year for you, cheer up. It’s a brand-new year! There is a biblical perspective we need to remember at the beginning of a new year. It’s a perspective that’s wrapped up in one simple word. If you remember not to use this particular word this year, your chances of succeeding are going to go through the roof. In fact, I think you’ll be happier if you make a decision here and now to cut this word right out of your vocabulary. I am designating it the “No-No” word for 2010. Just as we do with our small granddaughter, we say “No-No” to using this word. Cutting this one word from your life will force you to open your eyes to God, to His greatness. That is what Journey 2010 is all about-discovering the greatness of our Creator God. Perhaps you saw the recent news report of the Mom who had a heart attack while delivering her baby. The baby was delivered by emergency C Section (without anesthesia) and her newborn baby was delivered without a heartbeat as well. Dr Martin said she did not have a “great explanation” for why Mrs Hermanstorfer’s heartbeat returned. “Somewhere between four and five minutes she had been without heart rate and had stopped breathing a minute or two prior to her heart stopping,” she said. The doctors were then able to resuscitate the baby. Despite tests, she said doctors were still not sure about what had happened. However Mrs Hermanstorfer and her husband Mike have said they believed it was down to a miracle. Dr Martin said she would take help from wherever it came. This world ignores God. Clearly God was at work here. Perhaps he has great plans for this baby. The world just looks the other way rather than give glory to God. This year I want to Give Glory to God! I want this to be a Hallelujah Year. So by official Pastoral Proclamation I am banning one word from use at Pleasant Prairie. That word is “CAN’T”. If you catch anyone saying this word at church, it will be a $5 fine. If I use it in a sermon after today, fine me $5. That’s right. 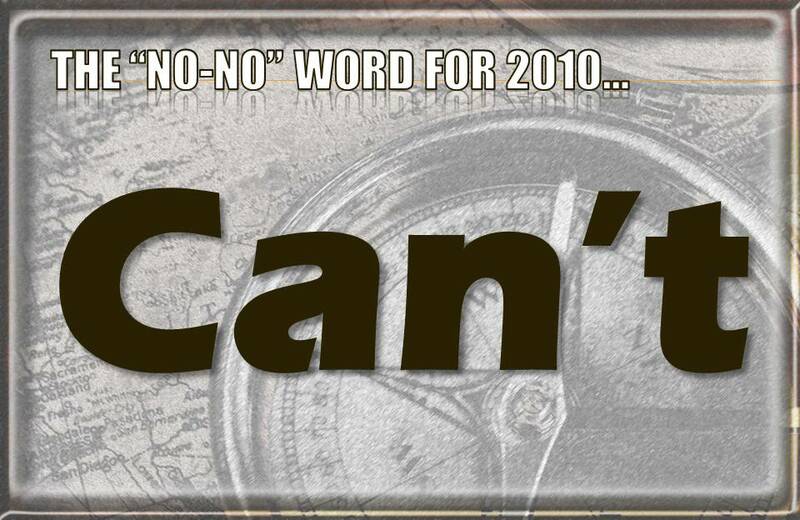 The one word you shouldn’t say in 2010 is the little word can’t. We use it all the time, don’t we? 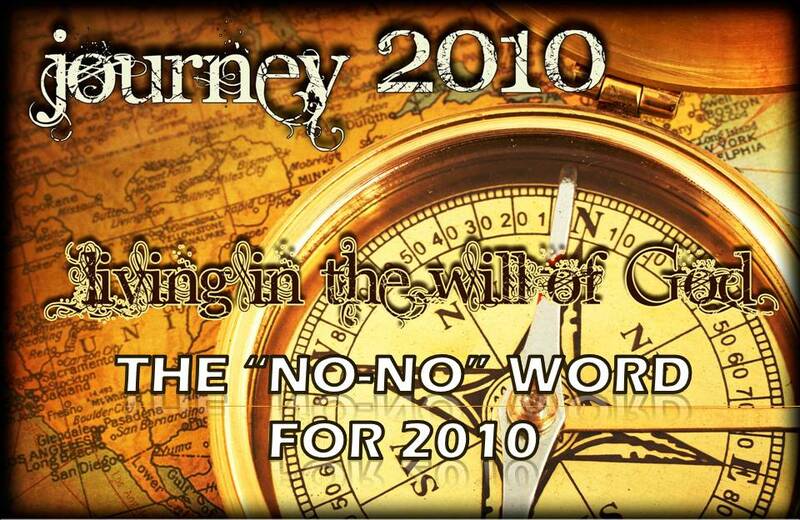 If 2010 is to be a year of Journeying with our Mighty God, it will be a CAN DO year. In order to understand and embrace this wonderful CAN DO God, we need to understand a few “CAN’TS from God’s Word. These Cannot’s help us understand how we can live in God’s will. Amazing how the cannot’s of God are not negative, but liberating to see Him! So let’s understand them, make them our foundation for our journey 2010, and then move on with our CAN-DO God! So here are the foundational Truth’s for our Journey into the Will of God and seeing Him as our CAN DO GOD! Accept Yourself: Mt 5:36 And do not take an oath by your head, for you cannot make one hair white or black. God is It! : Mt 6:24 “No one can serve two masters, for either he will hate the one and love the other, or he will be devoted to the one and despise the other. You cannot serve God and money. 1 Cor 10:21 You cannot drink the cup of the Lord and the cup of demons. You cannot partake of the table of the Lord and the table of demons. Mark 3:25 And if a house be divided against itself, that house cannot stand. We must accept ourselves as God designed us, we must decide that He is Lord, and we must decide that the condition of our soul is of primary importance in our life. If you journey with God you must be ready to go when He calls. No excuses, No delays. Spiritually Healthy: Mt 7: 18 A healthy tree cannot bear bad fruit, nor can a diseased tree bear good fruit. Pay Attention: John 8:43 Why do you not understand what I say? It is because you cannot bear to hear my word. Value God’s Word: John 10:34-36 Jesus answered them, “Is it not written in your Law, ‘I said, you are gods’? If he called them gods to whom the word of God came—and Scripture cannot be broken— do you say of him whom the Father consecrated and sent into the world, ‘You are blaspheming,’ because I said, ‘I am the Son of God’? Know the Holy Spirit: John 14:17 even the Spirit of truth, whom the world cannot receive, because it neither sees him nor knows him. You know him, for he dwells with you and will be in you. Abide: John 15:4 Abide in me, and I in you. As the branch cannot bear fruit by itself, unless it abides in the vine, neither can you, unless you abide in me. Seek Truth: 2 Cor 13:8 For we cannot do anything against the truth, but only for the truth. Let Go: 1 Tim 6:7 for we brought nothing into the world, and we cannot take anything out of the world. Know His Faithfulness: 2 Tim 2:13 if we are faithless, he remains faithful— for he cannot deny himself. Avoid Temptation: James 1:13 Let no one say when he is tempted, “I am being tempted by God,” for God cannot be tempted with evil, and he himself tempts no one. Self-Denial:Luke 14:26 “If anyone comes to me and does not hate his own father and mother and wife and children and brothers and sisters, yes, and even his own life, he cannot be my disciple. Luke 14:27 Whoever does not bear his own cross and come after me cannot be my disciple. Luke 14:33 So therefore, any one of you who does not renounce all that he has cannot be my disciple. Look to God: John 3:27 John answered, “A person cannot receive even one thing unless it is given him from heaven. Lose the Flesh: Rom 8:7-8 For the mind that is set on the flesh is hostile to God, for it does not submit to God’s law; indeed, it cannot. Those who are in the flesh cannot please God. Lose the Sin: 1 John 3:9 No one born of God makes a practice of sinning, for God’s seed abides in him, and he cannot keep on sinning because he has been born of God. Forgive and Love: 1 John 4:20 If anyone says, “I love God,” and hates his brother, he is a liar; for he who does not love his brother whom he has seen cannot love God whom he has not seen. Ok, Now to Get rid of Can’t from our lives, so we can focus on our Can Do God! 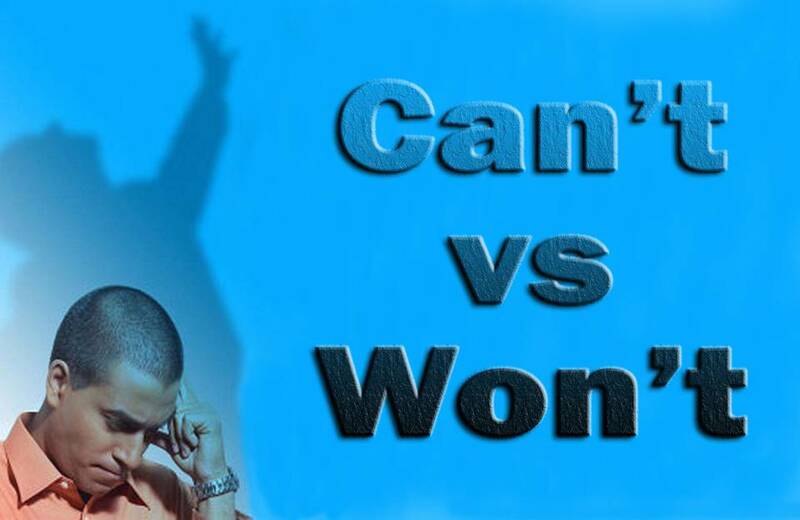 I think you can make a persuasive case that “can’t” is the single most destructive word in the English language. Suppose that you knew you could … in 2010? Could what? You could get out of debt. You could lose 20 pounds. You could restore a broken friendship. You could have a relationship with your spouse that is giggly and mushy again. You could get a new job. You could get a decent raise. You could get well. You could overcome your shyness. You name it. Suppose you knew that this year you could do it. What a difference that would make. What a great year 2010 would be! I want us to see that God is our Can Do God. If we are willing to focus on Him, depend upon Him, abide in Him, God will open up to us how truly Amazing and Awesome He is. I firmly believe that this year you can do everything God intends for you to do. You can live in His Will, you can live in His power! No matter how hard, no matter how difficult, no matter how impossible things may seem right now. If you want God to be your Strength, in 2010 you can! 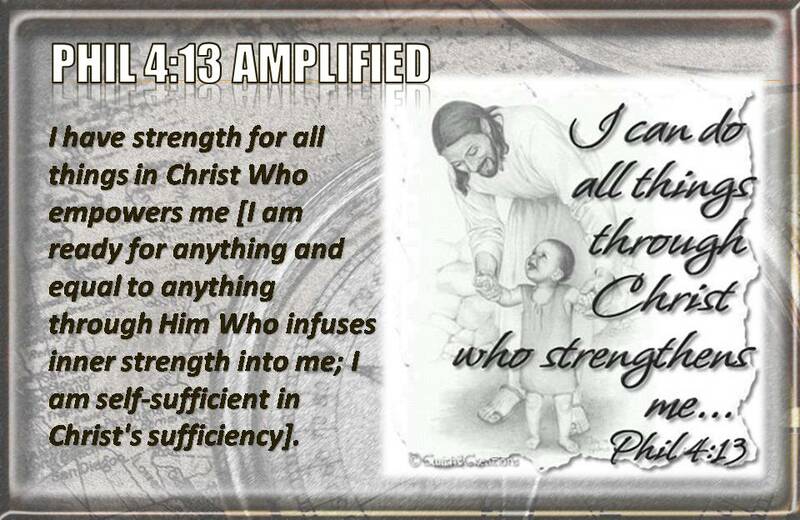 No matter what version you use, Philippians 4:13 is a verse of unlimited possibility. There is no way I can convey to you in this message the power this verse can have for your life. This verse must be experienced, but most of us take it for granted and say “ho-hum”. This verse has lost its power to amaze us, to challenge us, to encourage us and to convict us. 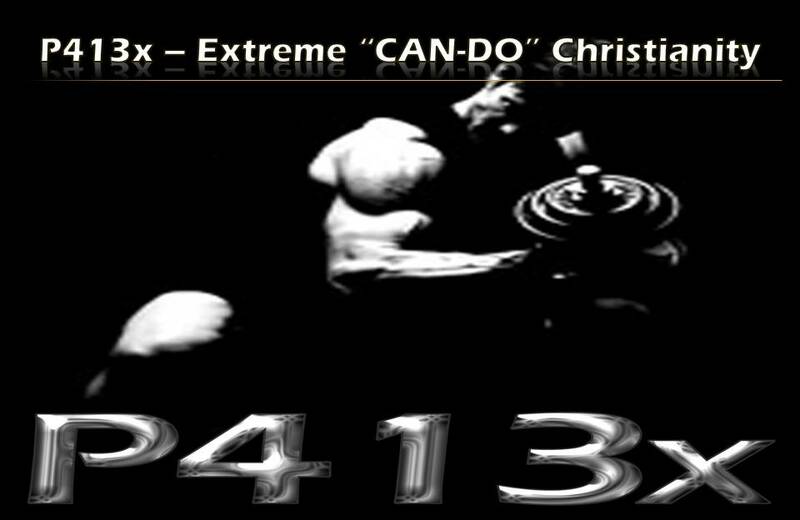 We need to see it in light of a New Marketing Campaign, calling it the P413x Extreme Christianity Fitness Plan! Here, then, is the question before us in 2010: The Bible says that you can do all things through Christ who strengthens you. “All things.” Can you really do “all things” through Christ? Is that just wishful thinking, just another piece of hopeful religious propaganda? Or is it literally true? “All things?” Most people would say, “Some things, yes. All things, no.” But the Bible clearly says, “All things.” Is this just hyperbole or is it literally true? Is this a verse upon which you can build a coherent, optimistic philosophy of life or is it just a bunch of mumbo-jumbo? 1. You Can If You Want To. 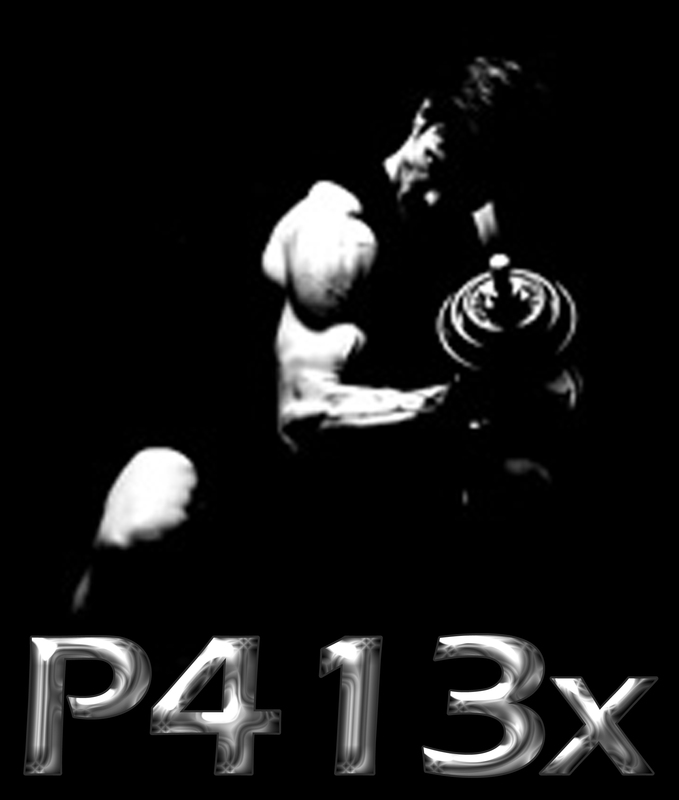 The P413x Principle of Personal Desire. Before you can, you must want to. Before the deed, there must be the desire. In order to accomplish your goals in 2010, you’ve got to decide what it is you truly want to do. 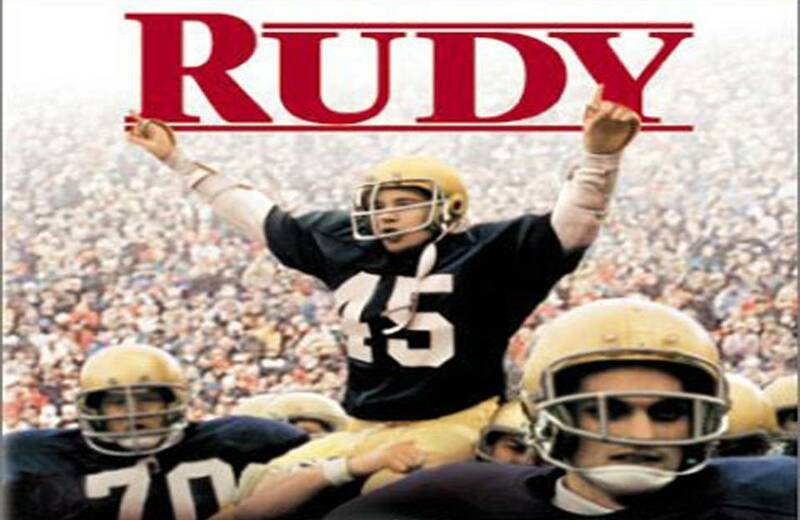 I love the movie called “Rudy”. Rudy Ruettiger harbored a dream to play for Ara Parseghian and the Fighting Irish football team, despite being merely 5’6″ and 165 pounds. Ruettiger earned a place on the Notre Dame scout team, a practice-squad that helps the varsity team practice for games. After Parseghian stepped down after the 1974 season, Dan Devine was named head coach. In Ruettiger’s last opportunity to play for Notre Dame at home, Devine put him into a game as defensive end against Georgia Tech on November 8, 1975. In the final play of Ruettiger’s senior season with the Fighting Irish, he sacked the Georgia Tech quarterback. Rudy was carried off the field by his teammates following the game. (Only one other Notre Dame player holds that honor). Now there were a lot of football games over the past four days—a fact many wives discovered when their husbands suddenly turned into TV zombies and sat in front of the tube 12 hours a day. One phrase we hear a lot when it is a closely fought battle (Penn St and LSU, Oregon and Ohio State, not MU and Navy)-“They Wanted It More”. That DESIRE is what winners have. One team wanted it more. Our Savior Jesus Christ wanted it More! That is why He went to the Cross! There’s an important lesson for us to learn. Isn’t it a principle in life that you usually get the things you really go after? Isn’t it true that if you really want something with all your heart, and if you focus all your energies toward one supreme goal, that’s what you’re going to achieve? That’s not the end of the story, but it is the place you have to begin. If you want it badly enough, you have a fighting chance of getting it. If you don’t really care, then it probably won’t happen. So many people who say they want to do things really don’t want to. If you don’t aim for anything, you won’t accomplish anything. One thing I have learned dealing with people in the ministry, and before that with employees; you get a lot further in dealing with your problems when you are honest about yourself. People never get anywhere making excuses or blaming others. If you’ve got a problem in your life, you’re going to get better faster if you stop saying “can’t” and start saying “won’t.” Once you start saying “won’t” you’ve put the matter in the right framework. When you say “won’t” instead of “can’t,” you have started to tell the truth. For most of us “can’t” is simply a convenient excuse. Is it possible for you to do “all things” this year? Yes it is. But first you must want to. That’s step number one—the P413x Principle of Personal Desire. Can you really do “all things” in 2010? 2. You Can If God Wants You To. 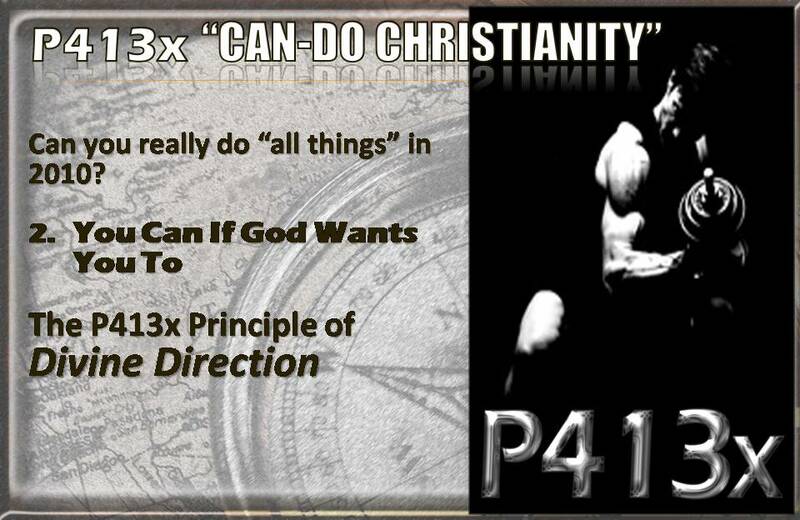 The P413x Principle of Divine Direction. It’s crucial for you to understand this second answer because it is clearly stated in the text. “I can do all things through Christ.” This verse is not a blank check. It’s not as if Paul is saying, “I can do anything I can dream up.” No. If you read the context, he is speaking about the varying and sometimes difficult circumstances of life. Then verse 13—”I have learned through the power of Jesus Christ that I can face whatever comes my way.” If it’s good, I can enjoy it. If it’s not so good, I can deal with it. Through Jesus Christ you can do everything God wants you to do this year. You can face everything he wants you to face, you can fight every battle he wants you to fight, you can obey every command, you can endure every trial, and you can overcome every temptation through Jesus Christ. 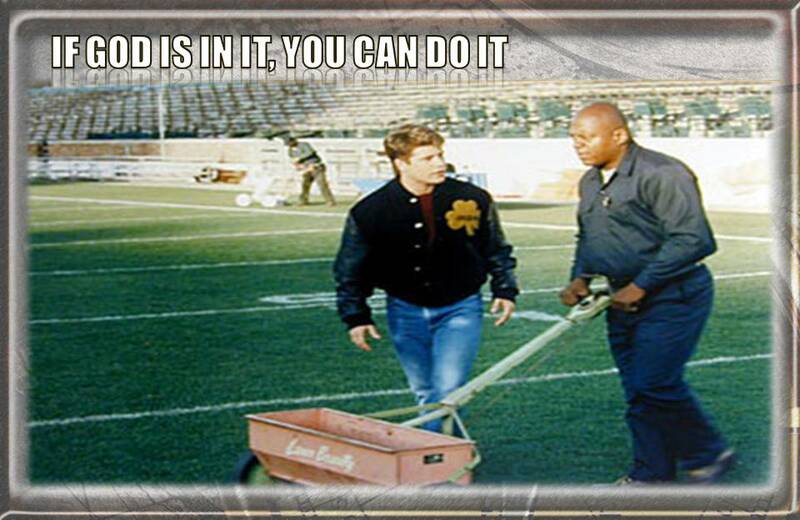 (Charles Dutton)Fortune: Hey, hey, hey, hey, hey what are you doing here don’t you have practice? Rudy: Not anymore I quit. Fortune: Oh, well since when are you the quitting kind? Rudy: I don’t know I just don’t see the point anymore. Fortune: So you didn’t make the dress list, there are greater tragedies in the world. Rudy: That I was somebody. Fortune: Oh you are so full of crap. Your five foot nothin’, a hundred and nothin’ and you hung in with the best college football team in the land for two years, and you were also going to walk out of here with a degree from the University of Notre Dame in this life time you don’t have to prove nothing to nobody except yourself and after what you gone through if you haven’t done that by now, it aint gonna never happen, now go on back. God doesn’t have to prove anything to you. He has done so much or you, you simply need to trust Him and say OK be my Can-Do God. Let me share a simple phrase with you: “If God is in it, you can do it.” That brings it all together, doesn’t it? If God is in your difficulty, you can face it. If God is somehow in your failure, you can overcome it. If God is in your dreams, your dreams will come to pass. If God is in your goals, you can achieve every single one of them. If God is in your prayers, he will not only hear them, he will also answer them. 3. You Can If You Rely on Jesus Christ. 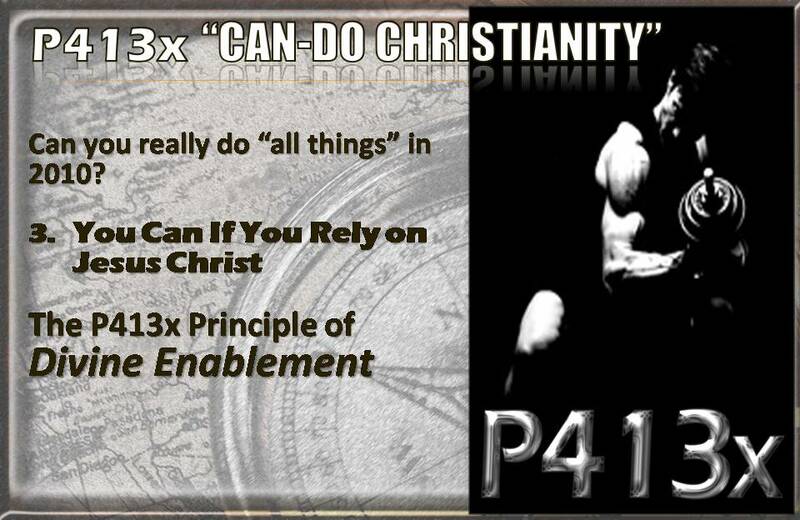 This is the P413x Principle of Divine Enablement. We come now to the heart of the verse: “I can do all things through Christ who gives me strength.” The last part of that verse is a participle in the Greek. The word itself means “to pour strength into.” It’s like pouring milk into a pitcher or water into a glass or coffee into a cup. It’s the picture of something empty that is filled by an outside source. It’s the picture of a believer facing the problems of life—hopeless and helpless—and in that situation; Jesus Christ pours his strength into the believer’s life. He strengthens us—by pouring his strength into us. This is what makes Philippians 4:13 totally different from things like Positive Thinking, “If you can dream it, you can do it.” and other purely secular approaches to life. Those techniques may be useful and may in fact help you to a limited degree, but if that’s all you’ve got, you still don’t have anything that impacts your heart. You may get up every day, look in the mirror and say, “Every day in every way I’m getting better and better.” That’s a nice thought, and if it helps you, okay. But that’s a far cry from the truth contained in this verse. How far will Positive Mental Attitude get you when you lose your job, when you come home and your wife has left you, when the stock market crashes, when your daughter has just decided to have an abortion? Where’s the hope for life? What will you cling to then? How will you find the strength to go on? Where is the anchor for your soul? It takes more than positive thinking. You’ve got to have Jesus Christ on the inside. Are we who believe better than other people? No. Are we stronger? No. Are we spared the problems of life? No. Are we tougher than others? No. Does God give us a free pass so that what happens to others doesn’t happen to us? No. Are we wiser than others? No. Do we suffer? Yes. Do we know heartache and disappointment? Yes. Do we see our dreams crumble? Yes. Do we face opposition? Yes. Do we get sick? Yes. Do our loved ones die? Yes. Do we know tragedy, tears and death? Yes. All that anyone else suffers we suffer too. What makes the difference? Only one thing. Jesus Christ within. We have the power of the indwelling Christ and that makes all the difference in the world. Is it enough? Is Jesus Christ enough for the problems of life? Is his broken body enough? Is his shed blood sufficient? Is his intercession in heaven able to sustain us? Can his power meet the problems of life? Yes, yes, a thousand times yes, and the saints across the ages testify that Jesus Christ is enough. You can do “all things” if this year you rely on Jesus Christ. Not on your own strength, not on your own power, not on your own wisdom, and not on your own ability to figure things out. But if you will say, “Lord Jesus, this year I’m relying on you,” you can do all things through Christ. 4. You Can If You Start Today and Don’t Look Back. 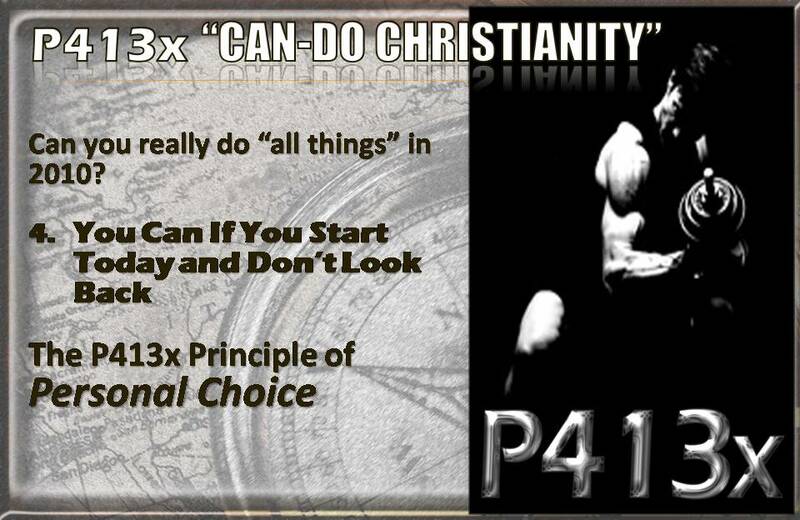 This is the P413x Principle of the Personal Choice. One question: Which way are you going this year? Are you going backwards into 2009 or are you going forward into 2010? Your answer makes all the difference. So many people I know live in the past, worry about the past, fret over the past. Forget it! 2009 is over, done, gone, kaput, finished. It’s never coming back. You can’t go back even if you want to. The old year is over, the new one is dawning. Wrap up the old year and give it to the Lord. Then strike out in 2010 to do great things for God. Notice that the first one is personal, the next two are divine, and the last one is personal. There’s perfect balance here. Two depend on you, two depend on God. Does it depend on you? Yes. Does it depend on God? Yes. Think of the verse this way: “I can do all things through Christ who strengthens me.” It begins with I, ends with me, and Jesus Christ is in the middle. I am not saying, “I can do all things.” Those are the words of a boaster. I am not saying, “I can do some things.” Those are the words of a doubter. I am saying, “I can do all things through Christ.” Those are the words of a believer. 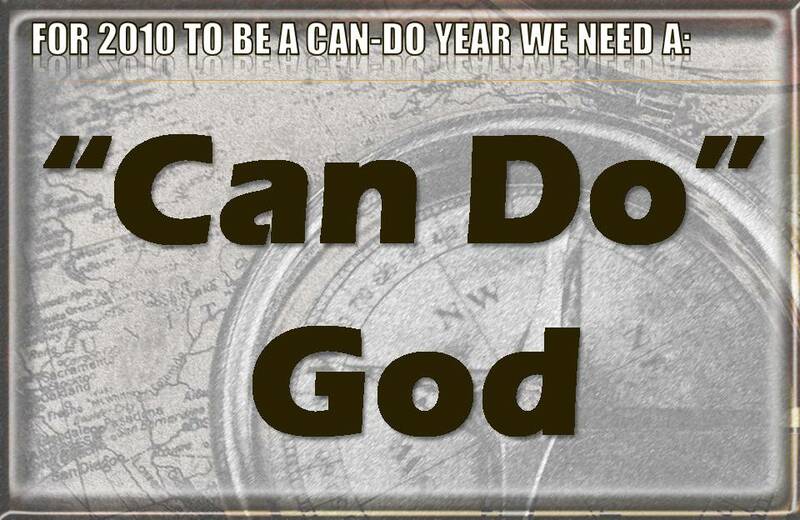 You can do in 2010 everything God wants you to do. You can fulfill his will in your life. You can obey every command, endure every trial and overcome every temptation. You can do everything God wants you to do this year—through Jesus Christ. 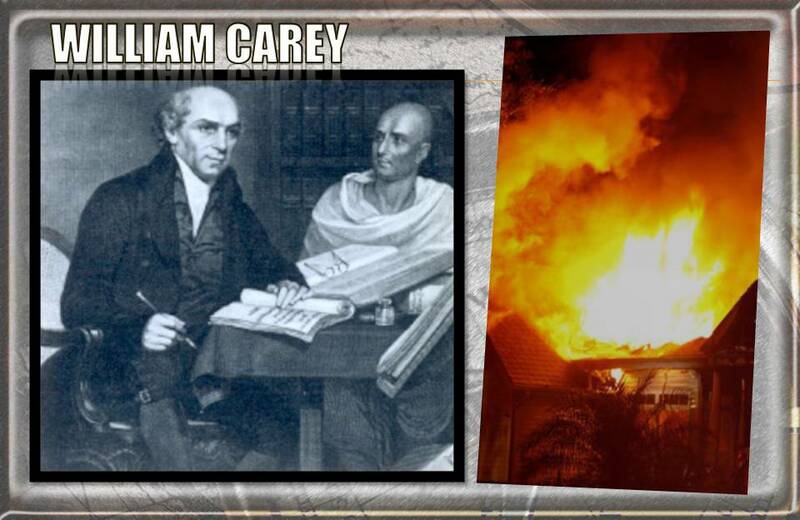 “William Carey… dedicated his life to spreading the gospel in India. Serving as a missionary there from 1793 until his death in 1834, he… [hoped] to translate Scripture into as many Indian languages and dialects as possible…. Many volunteers came to India to help as well. By 1832 Carey’s rebuilt and expanded printing operation had published complete Bibles or portions of the Bible in forty-four languages and dialects! Where are you as we look forward to 2010? Are you facing difficulties ahead? Are you facing financial difficulties? Some of you are facing tasks that are so difficult that it seems impossible. The year ahead seems impossible. Don’t despair, don’t give up, don’t think you are powerless. The Little Engine said I think I can, but in Jesus we say I know I can! Let’s make this very practical. In the space below, write down three goals that you believe God wants you to reach in 2010. It can be personal, professional, relating to your family, your marriage, your friends, your career, your dreams, any part of your life at all. What are you trusting Jesus Christ to do in your life in 2010? Are you willing to live in His Will? Can you really do “all things” in 2010? 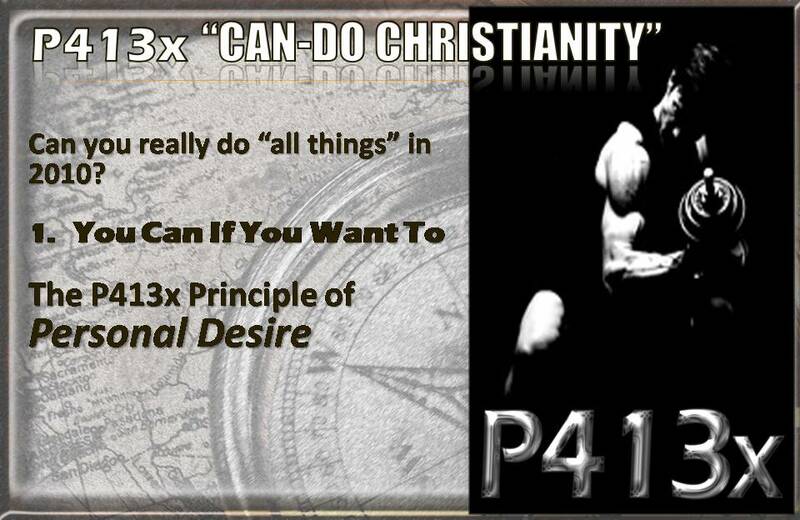 With the P413x System of Jesus Christ you can. Some suggest we no longer call this the Parable of the Prodigal Son, but the Parable of the Lost Sons. I suggest that we should call it the parable of the Lost Son and the Selfish Child. The younger brother was his SON again. This the Father demonstrated with the ring, the robe and the sandals. They meant the Father had RESTORED his RELATIONSHIP with his SON! WHY? Because our Father is is the Father of LIFE, of HOPE, of LIVING RELATIONSHIPS. Not only is God the God of the Living, but Paul declared this to the Romans: “Now the God of hope fill you with all joy and peace in believing, that ye may abound in hope, in the power of the Holy Spirit” (Rom. 15:13). Peter further explained that this is a Living Hope by the Resurrection: “Blessed be the God and Father of our Lord Jesus Christ, who according to his great mercy begat us again unto a living hope by the resurrection of Jesus Christ from the dead” (1 Pet. 1:3). God is the God of Hope by the Resurrection — in other words, by the triumph of Life over death. This means that in every dark situation, God never despairs and never gives up. For our Father knows the tremendous power of Resurrection, of Life. But as many as received him, to them gave he power to become the sons of God, [even] to them that believe on his name. John 1:12. Both Younger and Elder Brothers were the children of the Father, but as our Parable ends, only one was the SON of the Father. The Younger was the Son because he had come back to life and had come into a LIVING RELATIONSHIP with his Father. The Elder Brother was a child of the Father, but there was no RELATIONSHIP. The shocking truth of this Parable is that only the younger son reflected the character of the LIVING FATHER. The sinner was more like his Father than the righteous Elder Brother. WHY? Because the Younger Son was ALIVE, while the Elder Brother was DEAD in his self-righteousness. Matthew 5:9 & 45 use the word huios and it refers to those who reflect the character of God. The Greek word for child or children is teknon. In contrast to huios, it means the fact of birth whereas huios stresses the dignity and character of the relationship. Another aspect of this Greek word, huios, involves “likeness.” The New Testament contains the concept expressed in the proverb, “Like father, like son” (Matt. 5:45,48). It was typical Hebrew usage to employ the word “son” to express likeness. For instance, those who are peacemakers will be called God’s sons because they are like God (Matt. 5:9). God’s likeness, His image, will be “stamped” upon those who have been brought to maturity and adopted as sons (Rom. 8:29; I John 3:2-3). One way to understand the difference between the Elder and Younger is to understand another use of HUIOS with the addition of thesia or “huiosthesia” – “adopted or placed as sons”. In the Roman world, the father adopted as a son his own child. Birth made him a child (teknon); adoption made him a son (huios). Between the period of birth and adoption, there were stages of growth, education and discipline, until the maturity was reached for adoption into sonship. With adoption the son was recognized as one who could faithfully represent the father. He had arrived at the point of maturity, where the father could entrust him with the responsibility of overseeing the family business. The son becomes the “heir” of his father’s inheritance. Birth gives one the right to the inheritance, but adoption gives one the participation in the inheritance. The Elder Brother assumed upon the FATHER’S Stuff because of his natural birth, because he was the first born child. But what the Father was declaring was the SONSHIP of the younger brother because of the RESURRECTION and their restored RELATIONSHIP. Paul referred to the Corinthians as babies, still on milk. They had been born into the family of God, but had never matured, even though they had been enriched in speech and in knowledge of Jesus Christ (1 Cor 1:6). In fact, he said they were not lacking in any spiritual gift. The Corinthians probably saw themselves as the Elder Brother saw himself – the Mature Ones. But the Father called him a child, and Paul called the Corinthains babies! What makes the difference? How do we Elder Brother Types become SONS? Paul gives us the clue when he says “you are still of the flesh.” What does that mean to born again children of God? We have a LIVING RELATIONSHIP with the FATHER of the LIVING, but it is only through the Holy Spirit! We must walk after the Holy Spirit to enjoy this Living Relationship with our Father. It is not on the basis of our works that we have this living relationship. It is on the basis of the Holy Spirit being allowed to LIVE in us! The Father went outside and pleaded with his Elder Child. The word for plead is paraclete, the same word we use for the Holy Spirit! Picture the Holy Spirit pleading with all us EBT’s to reckon our flesh and works dead, and to FOLLOW HIM, to Walk in the LIFE of the Holy Spirit! This is the only way we will enjoy any RELATIONSHIP with the FATHER! He is the FATHER of the LIVING, the FATHER of those who have died to the flesh, and now walk in the Living Relationship of the Holy Spirit within us! The younger brother experienced that death and so was welcomed to LIFE. The Elder Brother saw no need to die, and so found no LIFE. Elder Brothers must realize they can be all righteous and moral but inwardly be walking corpses, dead to God! Our morality is worthless without a LIVING RELATIONSHIP with our LIVING FATHER! God is all about the RESURRECTION! He is all about LIFE! And ther can be no SONSHIP without the RELATIONSHIP! The Resurrection will bring all Elder Brothers (and younger) into RELATIONSHIP with the Father! What we can do to join the Feast?. 1. A startling new understanding of LOSTNESS—verse 28. The elder brother would have known that the day of the prodigal’s return was the greatest day in his father’s life. The father has “killed the fattened calf”, an enormously expensive extravagance in a culture where even having meat at meals was considered a delicacy. The older son realized his father was ecstatic with joy. Yet he refused to go into the biggest feast his father has ever put on. This was a remarkable, deliberate act of disrespect. It was his way of saying, “I won’t be part of this family nor respect your headship of it. And the father had to “go out” to plead with him. Just as he went out to bring his alienated younger son into the family, now he had to do the same for the older brother. Do you realize what Jesus is saying to his listeners, and to us? The Elder Brother is lost ! At the Very Least He is Missing out on Fellowship with His Father and Brother. The Pharisees who were listening to this parable knew what that meant. It was a complete reversal of everything they believed. You can almost hear them gasp as the story ends. And what is it that is keeping the elder brother out? It’s because: “All these years I’ve been slaving for you and never disobeyed…” (v.29). The good son is not lost in spite of his good behavior, but because of his good behavior. So it is not his sin keeping him out, but his righteousness. Why is the older son lost? a) There is No Relationship. b) There is No Companionship. c) There is Only a Selfish Child. The Father Parakaleo – came along side, is a picture of the Holy Spirit, pleading! Come in, Fellowship with me! The younger brother wanted the father’s wealth, but not the father. So how did he get what he wanted? He left home. He broke the moral rules. But it becomes evident by the end that the elder brother also wanted selfish control of the father’s wealth. He was very unhappy with the father’s use of the possessions—the robe, the ring, the calf. But while the younger brother got control by taking his stuff and running away, we see that the elder brother got control by staying home and being very good. He felt that now he has the right to tell the father what to do with his possessions because he had obeyed him perfectly. So there are two ways to be your own Savior and Lord. One is by breaking all the laws and being bad. One is by keeping all the laws and being good. If I can be so good that God has to answer my prayer, give me a good life, and take me to heaven, then in all I do I may be looking to Jesus to be my helper and my rewarder—but he isn’t my Savior. I am then my own Savior. The difference between a religious person and a true Christian is that the religious person obeys God to get control over God, and things from God, but the Christian obeys just to get God, just to love and please and draw closer to him. 2. ARE YOU AN ELDER BROTHER TYPE?—verses 29-30. Some people are complete elder brothers. They go to church and obey the Bible—but out of expectation that then God owes them. They have never understood the Biblical gospel at all. But many Christians, who know the gospel, are nonetheless elder-brotherish. Despite the fact that they know the gospel of salvation by grace with their heads, their hearts go back to an elder-brotherish “default mode” of self-salvation. AN ANGRY SPIRIT (v.28—“became angry”). But he was angry (ōrgisthē). First aorist (ingressive) passive indicative. But he became angry, he flew into a rage (orgē). This was the explosion as the result of long resentment towards the wayward brother and suspicion of the father’s partiality for the erring son. Elder brothers believe that God owes them a comfortable and good life if they try hard and live up to standards—and they have! So they say: “my life ought to be going really well!” and when it doesn’t they get angry. But they are forgetting Jesus. He lived a better life than any of us—but suffered terribly. Would not go in (ouk ēthelen eiselthein). Imperfect tense (was not willing, refused) and aorist active (ingressive) infinitive. Selfish people are Fleshly People. They are Dead, but don’t realize it. The Elder was dead and did not realize it. The Younger was dead, and realized it. A SPIRIT OF Joyless and Dutiful Obedience (v.29—“I’ve been slaving for you”). Younger son – I’m not worthy, make me a slave, Father makes him a Son. Elder son – I’m your obedient son, so he becomes the obedient slave. In the world you spend money because it is beauty. Elder Brothers pray but not adoring God. Prayer is a duty, not a beauty. I obey and obey but I don’t get anything out of it. Everything went wrong becasue he was faithful and obedient. mechanical, slavish thing as a result. A SPIRIT OF Coldness to Younger Brother-types (v.30—“this son of yours”). You Don’t Rejoice in what the Father Rejoices in. You have Religious and class superiority. If you ground your value in success or hard work, you have to look down your nose at the poor, the perceived lazy. When you look at people of different races, classes, you look down at them or creeped out at them you are an elder brother. The older son will not even “own” his brother. Elder brothers are too disdainful of others unlike themselves to be effective in evangelism. Elder brothers, who pride themselves on their doctrinal and moral purity, unavoidably feel superior to those who do not have these things. If you hate other cultural styles and customs, you are an elder brother. You don’t grow in love in sweetness. Do evidences of the joy and presence of the Holy Spirit. Jesus doesn’t lash out at them, condemn the Parisees, the ones who will kill him. You are alienated from the Father’s heart, my child, While we were yet enemies, Christ died for us. The Cross is the greatest challenge to us. We are so messed up that nothing short of the cross will save you. See the humiliation of the Cross, and the Affirmation of His Love for You. A DOUBTING SPIRIT – Lacking Assurance of the Father’s Love (v.29—you never threw me a party). As long as you are trying to earn your salvation by controlling God through your goodness, you will never be sure you have been good enough. What are the signs of this? Every time something goes wrong in your life you wonder if it’s a punishment. Another sign is irresolvable guilt. You can’t be sure you’ve repented deeply enough, so you beat yourself up over what you did. Lastly, there is a lack of any sense of intimacy with God in your prayer life. You may pray a lot of prayers asking for things, but not sense his love. The elder brother does not want the father to forgive the younger brother. It is impossible to forgive someone if you feel “I would never do anything that bad!” You have to be something of an elder brother to refuse to forgive. 3. What we can do about this spiritual condition? Jesus ends the parable with the lostness of the older brother in order to get across the point that it is a more dangerous spiritual condition. The younger brother knew he was alienated from the father, but the elder brother did not. If you tell moral, religious people who are trying to be good, trying to obey the Bible so God will bless them—that they are alienated from God, they will just be offended. If you know you are sick you may go to a doctor; if you don’t know you’re sick you won’t—you’ll just die. These are two radically different, even opposite, dynamics. Yet both sets of people sit in church together, both pray, both obey the Ten Commandments, but for radically different reasons. And because they do these things for radically different reasons, they produce radically different results—different kinds of character. 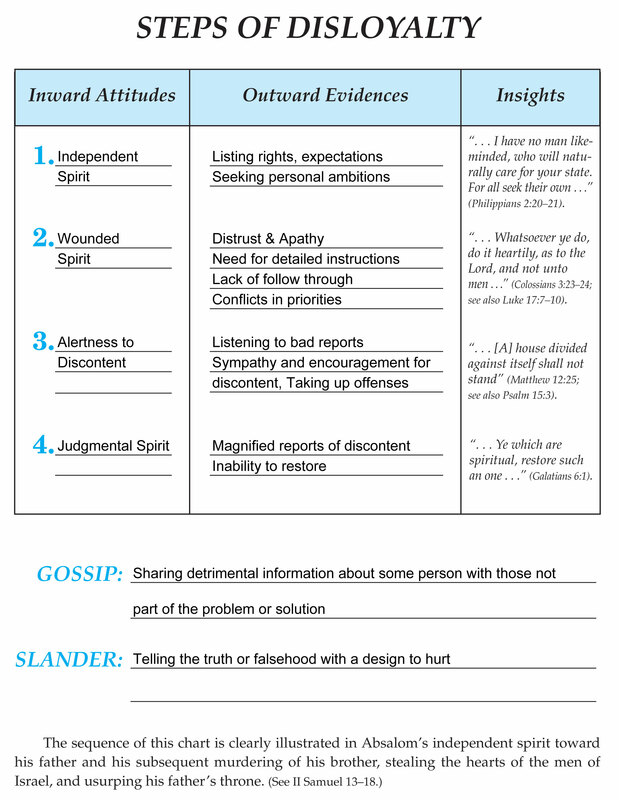 One produces anger, joyless compliance, superiority, insecurity, and a condemning spirit. The other slowly but inevitably produces contentment, joy, humility, poise, and a forgiving spirit. Unless a person and a congregation knows the difference between general religiosity and the true gospel, people will constantly fall into moralism and elder-brotherishness. And if you call younger brothers to receive Christ and live for him without making this distinction clear, they will automatically think you are inviting them to become elder brothers. Must learn to see yourself through the eyes of the Younger Brother. Second, we HAVE TO EXPERIENCE LIFE OF THE HOLY SPIRIT. The Father Entreated (parekalei). Imperfect tense, he kept on beseeching him. This is a picture of the Holy Spirit pleading for the Elder Brother to surrender to His Control, to allow Him to be in charge, and thereby experience the feasting of FULL FELLOWSHIP with the Father and the Son. Remember, again, whom Jesus is speaking to (vv.1-2). Jesus is speaking to his mortal enemies, the men he knows will kill him. On the one hand, this is an astonishingly bold challenge to them. He’s talking to those who want to kill him and telling them that they are lost, that they fundamentally misunderstand God’s salvation and purpose in the world, and that they are trampling on the heart of God. But at the same time, he is also being so loving and tender. When the father comes out to the older brother, that is Jesus pleading with his enemies. He is urging them to see their fatal error. Jesus does not scream at his enemies, or smite them, but lovingly urges them to repent and come into his love. And so we have a foreshadowing of that great moment on the cross when he says, “Father, forgive them, for they do not know what they are doing” (Luke 23:34). This love toward his enemies made him vulnerable and cost him his life. On the cross, instead of blasting his enemies, he lovingly took the penalty of their sins on himself. While we were his enemies, Christ died for us (Rom 5:10). Knowing what he did for us must drain us of our self-righteousness and our insecurity. We were so sinful he had to die for us. But we were so loved that he was glad to die for us. That takes away both the pride and the fear that makes us elder brothers. We must stop trying to climb our own ladder to heaven. It is fruitless, it is hopeless. Only when we go to the cross and die to what we are and want and hope, and reach up and take the hand of Jesus – will we have the proper relationship with our Heavenly Father. We will be ALIVE, partakers of the Resurrection of Jesus Christ. What was the difference between the younger and the elder brother that meant that one could enjoy the feast and the other could not? The Prodigal or younger son feasted with the Father, while the Elder Brother did not go in, even though the Father begged him. Why is it that some Christians experience the power and presence of God and some do do not? Why do some of God’s children live victorious lives while others are in a state of constant defeat? The difference is not explained by the presence or absence of the Father. He is present with every child of His. God is Father to both sons, yet only one enjoyed the feast. Why? The younger son had come to a place of deep reverence for his Father, while the Elder Brother had not. The prodigal son recognized the Divine ownership of his life, while the Elder Brother was still his own master. Peter wrote “Sanctify in your hearts Christ as Lord” (1 Peter 3:15) Elder Brothers will never feast with the Father until they realize He is Lord of every aspect of their life. Elder Brothers must let go of everything, and realize it is all the Father’s. He is Lord! The Prodigal returned with nothing. Even his reputation and standing were gone. He had become as nothing. He had no where to go but to the Father’s arms. Instead of scorn, his Father kissed him and opened his storehouse of grace to him. Can you feel the great reverence and humility that must have overwhelmed the prodigal’s heart? Such a Father! Such a Relationship! His Father became the Lord of his life! The Elder Brother clung tighter to his world, and refused to reverence the Father’s wishes. He gained his world, but lost the Father’s Heart! Elder Brother, how is your relationship with the Father? Do you feast with Him every day? Or is your relationship cold, lifeless, sterile? Open your arms to Him as your Lord. Realize you are nothing without Him. Father: I want your Life! Teach me that I am nothing without you. Nothing in the world matters except my relationship with YOU! Joseph was a younger brother, but had the characteristics of an elder brother. He was responsible, industrious, kept out of trouble. What was the driving force of Joseph that enabled him to escape the normal pitfalls of being either a lost younger or a lost elder brother? I think the driving force of Joseph was his confidence in God’s plan for his life. Joseph saw his life, no matter the place or dungeon he was in, as in the PURPOSE of GOD! In Genesis 50:20 Joseph addresses his elder brothers: “You meant evil against me; but God meant it for good!” Earlier in chapter 45 he revealed his awareness that “God sent me before you to preserve life.” This awareness of God’s divine purpose for our life is what elder and younger brothers need to have. If we focus on ourselves, on our things as the two lost sons did, we fall away from the Father’s heart. But when we draw near to him, whether in the pigstye or the crop field, we will see that He is accomplishing something Divine, Holy, even Loving. God has a purpose for each path He has us on. Some may resent their parents, some thier spouse, some their job, some their circumstances. God has a purpose through it all. When we focus on His heart and His purpose, we will come to our senses (our God Sense) and willingly accept His grace, His will, His plan.